Vegetables take on a sultry, irresistible look when in the hands of our next two subjects and it’s easy to see why. Whether they’re expounding the virtues of clean, vegan eating or rethinking the way veggies are presented in meat-loving South Texas, Tim “the Girl” McDiarmid and Rebecca Marie “Rebel Mariposa” Lopez are slowly, but surely elevating local produce by the caseload. While their backgrounds couldn’t be more different, the women are working together and separately to provide fibrous options for your next special event. We sat down with each to talk about their story, their food journey and how they’re highlighting South Texas produce. For McDiarmid, the food saga began at an early age. The Canadian transplant grew up in what she called a winter wonderland. “We ate tons of vegetables from our garden. We had such a limited growing time. When I moved here, it was crazy that all year round there would be farmers markets with fresh produce, and no one was using it,” McDiarmid said. Actually getting to San Antonio took her a while, much to our chagrin, as McDiarmid spent 18 years working the restaurant scene in New York, from catering to bartending (and even a stint as an interior decorator). When she finally relocated to San Antonio, McDiarmid, mother to an energetic pre-teen, was looking for a slightly slower pace than that of the Big Apple. She took a year to figure out her groove in SA and work on her vision. This led to the creation of Tim the Girl, McDiarmid’s multi-faceted company that envelops catering, event planning, weekly meal delivery, cooking classes and consulting. Her work became ubiquitous with bright, family-style affairs. “My whole philosophy is like, you don’t have to be vegetarian, but I believe meals should be vegetable-driven. Vegetables should be the highlight,” McDiarmid said. She’s not one to shy away from much, and this includes animal proteins, but her biggest hits have steered toward produce, which is featured prominently and deliciously on all her menus. “A lot of time is spent figuring out, without ruining, a vegetable. Covering a vegetable in cheese or pork is cheating, and it’s not responsible,” McDiarmid said of her process. As Tim the Girl has grown, so have her other ventures. She’s helped design menus for Uncommon Fare, a modern-day grocery store located on the ground level of the Cevallos Lofts, as well as the food menu for Rosella Coffee Co. (yes, this means she’s the one responsible for your avocado toast obsession). In 2011, she decided to further her brand by teaming up with furniture artist Peter Zubiate to launch the Special Projects Social, a series of pop-up restaurants and art events around town. During its first year, the SPS was held on a monthly basis. Now held three times a year, the events are evening-long affairs that start with a cocktail hour by Jeret Peña and members of the Boulevardier Group; guests are seated along Zubiate-designed community tables and courses are presented family-style. (McDiarmid loathes plated dinners.) Plates, menus and any centerpieces are usually made, printed and/or screened by area artists. And although she’s created several hundred menus by now, McDiarmid’s biggest hits are usually her most simple creations. She and her growing team will make batches of her now famous citrus salad, which uses vibrant citrus, pickled fennel, pistachios, olives and chiles topped with a light drizzle of Salud de Paloma extra virgin olive oil, along with a Tuscan kale salad that combines high-quality olive oil, lemon juice, sea salt and finely sliced kale. In order to keep the creative juices flowing, the 44-year-old also travels extensively throughout the States and abroad. She’s teamed up with a college friend, Bianca Gignac, to help host culinary trips to Italy, aptly named the Italian Fix. During these weeklong jaunts, McDiarmid and co. (the group is made up exclusively of women, usually between the ages of 19 and 77) bounce around the Italian countryside learning about pesto and cheese. “It’s a week of awesome,” she said. Although McDiarmid is cherry-picking projects more judiciously these days, she’s careful to make sure her vision stays intact. 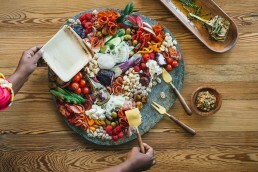 She’s hired a staff of culinary goddesses, including Monessa Maria Esquivel, D Martinez, Anna Margaret Fisch Hamlin and Rebel Mariposa, to help broaden SA palates within the scope of aesthetics and design. McDiarmid also serves as mentor and friend. And as her staff eventually breaks away to kick off their own businesses, McDiarmid stresses the difficulties of jumping into the field. Lopez’s turn at cooking took a bit longer than McDiarmid’s. The 35-year-old artist and performer is a San Anto native that fondly remembers Sunday morning trips to her local tortillería. “Every Sunday, I have a beautiful memory of me and my brother walking down West Avenue to the little tortillería to buy a dozen fresh tortillas, a half pound of barbacoa, two avocados and then a lime and salsa and then we would walk back,” Lopez said. It wasn’t until she was at the University of Texas that Lopez began exploring the concept of vegetarian eating. She relocated to San Diego in the mid-2000s and began dabbling in vegan and raw fare. “I always used to joke in California, that if a Mexican Texan can become a vegan, anyone can be one,” Lopez said. Although her reasons for taking on a vegan lifestyle were two-fold—as a performer, she wanted to maintain a healthy diet for her active lifestyle as a dancer, and she also cites animal welfare as reasons she gave up meat—Lopez often chooses family and culture over being militant about her diet. “I just kind of make the compromises where, if I am going to sit down and I have dinner at my grandmother’s with my tías, I have the corn and the rice and the beans and I don’t ask about it,” Lopez said. Once in San Diego, she began experimenting with foods and wanted to share newfound skills with area friends. She began inviting friends over for vegan feasts in order to share beautiful, nourishing eats as a way to give back and offer her friends something healthful. This led to her helping co-create True Kitchen Creatives, which served as an outlet for plant-based food events and experiences. Lopez eventually found herself back in San Antonio in August of 2013 and she connected with McDiarmid through a mutual friend. “She interviewed me and I think two days later I was in her kitchen working with her. Yeah, we connected right away, because she’s not from here, I had been gone for so long, so we could bond in that way of having good conversations about our ideas and what we felt San Antonio was like, and we really enjoyed and we still enjoy it,” Lopez said. She’s also spreading the vegan gospel locally while also helping her fellow man through Rebel Eats, an educational food catering collective with Nadia Casaperalta (a CIA grad who also cooks at Hot Joy) and other artists. Her two biggest events as of late took place in the summer and fall of 2014. The first was a pop-up benefit dinner for Central American women and children refugees in July inside a private residence. “We took donations, but also brought down a truck-load full of supplies to the Valley,” Lopez said. In November, the collective hosted a fundraiser for UTSA’s Mexican American Alumni Association. The menu for the second fundraiser was slated as a Mexican-style brunch inside Señor Veggie, complete with jackfruit barbacoa, a tortilla de papa similar to a tortilla española, a nopal and pumpkin scramble, crepes, pozole and chocolate donuts—all vegan, of course. Any hesitation by Lopez, as to whether her audience will embrace vegan eats, is quickly put to rest by her take on presentation. Such hits have included pumpkin and black bean chili for a Halloween party, along with barbecue jackfruit sliders, but much like McDiarmid, Lopez changes menus according to her clients needs, within reason and season. “I have an uncle who’s been in the produce business for 30 years and that’s the one that I call and say, ‘These are the things I need, what can your farmers get me? '” Lopez said. She’s trying to help re-envision plates across the board. “I understand wanting a breakfast taco, of course. I don’t think that breakfast tacos are evil. I just think that breakfast tacos can look different. They don’t always have to be potato and egg or bacon and egg or carne guisada. It can be a corn tortilla and some nopales,” Lopez said. For Lopez, eating vegetables shouldn’t be off-putting. We recently attended a wedding catered by Tim The Girl in San Antonio. There were just over 250 of us, but the whole aesthetic and design of the night made it feel like an intimate and fun family party. We hired Tim the Girl for our wedding and she and her crew knocked it out of the park! Not only was the food incredible, but her team did so much more than cater – they helped us make crucial decisions about the flow of the evening, set up, and decor. I would recommend Tim 100% for any event! I have used Tim for a number of catered events, from casual to more formal. She has helped me entertain and impress clients – she makes everything easy, beautiful and tasty. Highly recommend! Tim the Girl recently catered my event with a palatial spread, giving guests excellent food that was light, fresh, and beautifully plated. The food was absolutely wonderful, from preparation to presentation. Tim’s brilliant spirit is complemented by stunning design sense, a feel for the community, and the ability to deliver a transcendent culinary experience. I would definitely recommend Tim the Girl for any event, big or small. Tim the Girl is AWESOME!!!!! We hired Tim the Girl for a corporate event for 1000 Guests. As we were coming in from out of state we needed someone we could rely on as our local contact as well as provide great food. The minute I spoke with her I knew she was exactly what I was looking for. Tim and her staff were amazing. The food was DELICIOUS & CREATIVE – the presentation was BEAUTIFUL – the buffet decor was PERFECT for our theme & the whole night was a huge success. I would definitely encourage anyone looking for a caterer to hire her. Tim goes above and beyond to make her events a special experience for your guests! Tim, thank you for making our wedding day such a special occasion. The Mediterranean buffet was beautiful and delicious. The service was friendly and excellent. We had nothing to worry about – you took care of everything. We received so many compliments from our guests. We would recommend your services for any occasion. Thank you so much! Tim, I cannot thank you enough for the great job you did at my party! I had some quirky ideas, to be sure, but you picked up the ball, and ran with it! Menu was imaginative and flawlessly executed- delicious to the mouth and eye. And your staff! What can I say? They, too, got into the spirit of the whole theme while keeping everything served beautifully and did a great cleanup as well- can’t wait to get you all back into action for the next one. Tim the Girl: 3 parts chef table,1 part hands-free catering! Tim deftly pairs a relaxed feel with top notch service which led a guest at our event to mistake her crew for fellow family members lending a hand in our home. Nary a heavy sauce, overcooked vegetable or bulk buy grocery product in sight, the food was innovative and fresh yet at the same time showcased local flavors. We look forward to collaborating on future events. Our menu concept was simply that, a concept, until we connected with Tim McDiarmid. Tim’s passion for concept design as well as creating a solid flow of similar ingredients throughout the meal options come through perfectly to meet our goal of not only providing amazing coffee, beer and wine but food that pairs well with it. We look forward to a long relationship that will grow along with our menu. © 2010-2018 Tim the Girl Catering. All rights reserved.